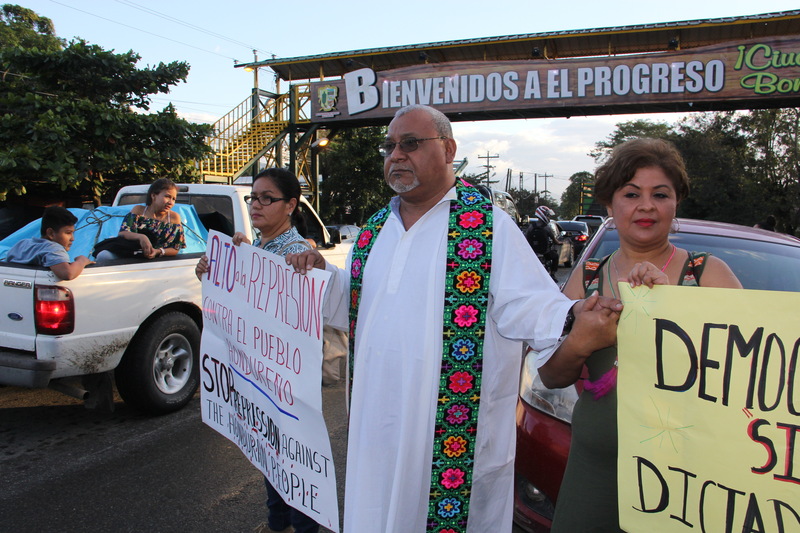 Padre Melo leads a protest into the streets of El Progreso (Kevin Clarke/America). This afternoon’s demonstration draws people from homes and businesses along the highway, shouting and applauding the marchers. Motorcycle and car horns add to the cacophony, not in anger at the snarled traffic but in exuberant support for the marchers. Ismael Moreno, S.J., known affectionately here as Padre Melo, celebrated the Mass before leading this community out into the street, surrounded by fellow Jesuits from around the Americas and an inter-religious group from the United States. That delegation had been assembled by SHARE El Salvador, the Sisters of Mercy of the Americas’ Justice Team, the Friendship Office/Honduras Accompaniment Project and the Interfaith Movement for Human Integrity in a hurried show of solidarity with the Honduran priest. As he has continued his activism against the controversial second term of President Hernández, pamphlets began circulating in town and on social media condemning Padre Melo and his supporters as people intent on “setting Honduras on fire.” The flyers were an ominous development, one that unpleasantly paralleled threats against other priests in the region in the recent past. The delegation he helped organized is intended to remind dark forces in Honduras that Padre Melo has friends and supporters in the United States. “We have 50 religious leaders from the United States, from all over…at the invitation of the religious community and religious orders and the Jesuit community [in Honduras] to accompany them because there have been a number of threats against defenders of human rights” and because of the many deaths of demonstrators at the hands of the national police or military since the contested election results were announced in November. The people here, he says, “feel that the elections were stolen.” Resistance to the impending inauguration is especially fierce in this area of northern Honduras, around San Pedro Sula, where most voters supported opposition candidate Salvador Nasralla. The Organization of American States, citing many irregularities, initially had urged that a new election be held, but as the weeks have passed and the United States recognized the Hernández victory, opposition both within and outside Honduras has waned. That is not apparent during this march on Jan. 25, two days before the inauguration will be held. Here, the chants of “Fuera JOH!” “Get out JOH,” (an abbreviation of the president’s name) continue in a persistent taunt. Mr. Artiga is pleased at how peacefully this procession has been conducted so far. The police have not only not attempted to break up the march, a small squad is actually escorting it, idling just ahead of the marchers and clearing the path of motorcyclists and fast u-turners. He says community members are convinced that the change in response is due to the presence of the American delegation. The people here, he argues, are rightly frustrated. After the popularly elected President Manuel Zelaya was removed by the military in 2009, the nation endured the presidency of Porfirio Lobo Sosa and then experienced Mr. Hernández’s first win in another election that many suspected was marred by fraud. Central America, says Mr. Artiga, speaking of his native El Salvador, has already painfully experienced what can happen when the people give up on an electoral process they perceive as stacked against real democratic expression. He sees many disturbing parallels with the Salvadoran experience. On Jan. 27 Mr. Hernández will be sworn in for what had previously been prohibited by the nation’s constitution, a second consecutive term as president of Honduras. The afternoon march in El Progreso has its fair share of exuberance and seems to provoke real excitement among the faces of working people heading home in buses and pickup trucks—but it is not clear any of that matters. What many may truly be marching for today is not a halt to what seems like an inevitable inauguration but a civic gauntlet thrown down before what may come after it when a president of questionable legitimacy seeks to solidify his authority over a defiant public.